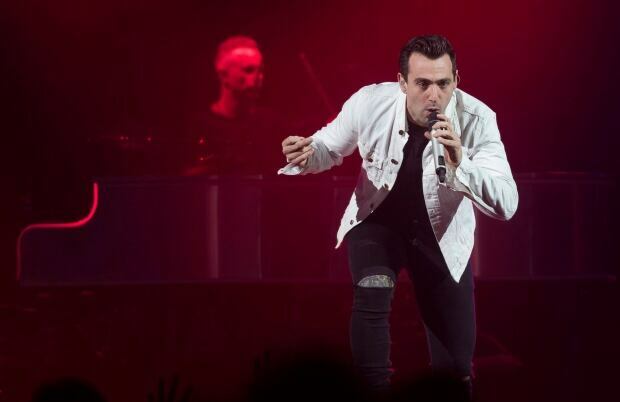 A Calgary radio personality shared what she’s calling her #MeToo moment involving Hedley singer Jacob Hoggard live on-air Wednesday — prompting the station to stop playing the Canadian band’s tunes. Katie Summers says Hoggard made comments of a sexual nature toward her and grabbed her backside after an interview. “It happened so quickly, but I remember it so clearly,” Summers, one half of AMP Mornings With Katie & Ed on 90.3 AMP, said over the airwaves about the incident seven years ago. She was 23 at the time and it was her first major market radio job after college. “I had been a Hedley fan since they had first come out. I watched Jacob Hoggard on Canadian Idol way back in the day. I saw them perform at SAIT. It was a big deal to me. I was very star-struck,” she said. Someone who witnessed the encounter has backed up Summers’s story, but CBC News has agreed not to identify that person. The radio station and her co-workers have been supportive of Summers. The station tweeted a video of her sharing her story. Summers’s on-air co-host, who just goes by Ed, says he understands why she waited to share her story. “For anyone that is at that point in their career, they don’t want to screw this up. If I come forward, what’s it going to do to my future in this industry?” Ed said. Summers says she just hopes it will encourage other people to tell their story. “Of course I was scared, just like everyone else. I don’t know what people are going to say. It’s easy to get lost in fear of what others might think or you could just say, ‘Hey, this happened to me and I don’t really care what you think about it,'” Summers said. A Manitoba woman has accused Hoggard of sexually inappropriate behaviour and says dozens of other women have similar stories, shared with her since she started the Twitter hashtag called #outHedley2k18. “All of us in Hedley are active on social media, because that is the main way we hear from our fans across Canada. Because we are active on social media, we often see things said or alleged that simply are not true. That is what we have seen over the past week: allegations made against us by anonymous accounts that are completely, totally false,” a spokesperson for the band said in an email. An Ottawa woman has accused Hoggard of sexually assaulting her in 2016, an allegation he denies. A spokesperson for Hoggard said the encounter was consensual. The band withdrew from the Juno Awards. Several radio stations, including CBC, have stopped playing the band’s music and their management team cut ties with them. CBC News reached out to Jacob Hoggard’s lawyer for comment on this latest allegation, but have not yet heard back.